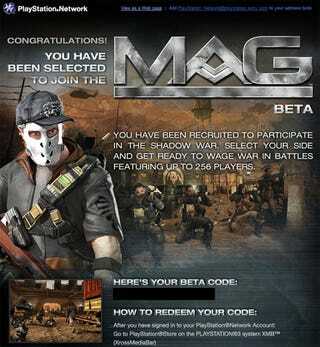 Did You Get Into The MAG Beta? If you applied for the MAG beta, you might want to check your inbox, because successful applicants are having their beta download codes sent out as you read this. Some fun facts to go along with the news: the download is just under 2.5GB, and like some other betas, it has limited opening hours, namely between 1000-1300 and 1700-2000 PDT, Monday through Friday. Kind of limiting, we know, but hey, at least you could do some proper beta work with those times; Sony need help demoing the game at GamesCom this week to those on the showroom floor, so from Wednesday through Sunday people logging in around midnight might find themselves in the unpaid service of Sony Computer Entertainment Europe!